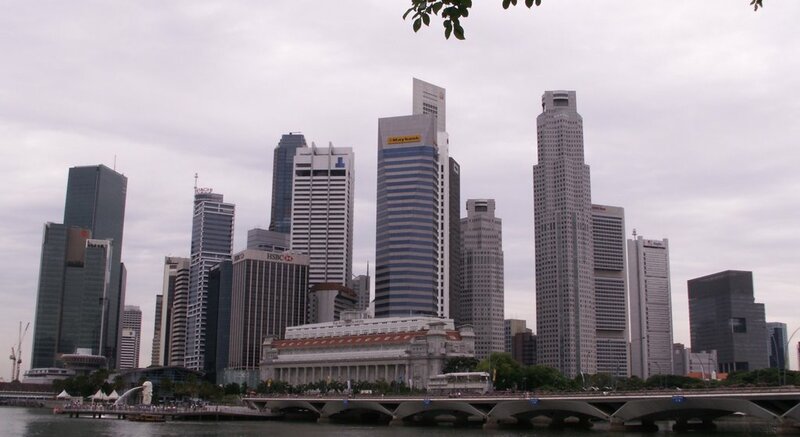 There's one little detail about my trip that I left out in my last post about Singapore. When I was walking past the Victoria Theatre I noticed this poster. 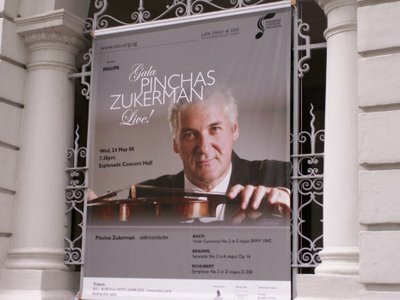 I did a double take when I saw this because I could hardly believe that I was lucky enough to be in Singapore at the same time Pinchas Zukerman would be performing and conducting at the Esplanade. That night I booked a ticket online and eagerly awaited my chance to see the concert. It turned out to be a wonderful way to finish my trip. Zukerman played Bach's Violin Concerto No 2 in E Major and then conducted Brahms' Serenade no 2 in A major and Schubert's Symphony no 3 in D major. I rather wish he had played more than he conducted, but it was still quite an impressive concert. Apparently I wasn't in the only person in the office who was thinking this, because at the end of the evening everyone called for an encore. Zukerman responded by leading the audience in a brief rendition of Brahms' lullaby. (Yes, leading the AUDIENCE! He asked us to sing along.) Clearly he was ready to go home. 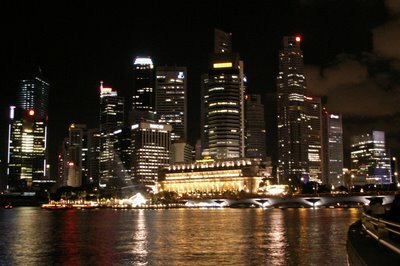 Of course I didn't want to go home quite yet, so I took the opportunity to do a little bit more sight seeing. Before I went into the Esplanade for the concert I snapped a few pictures from the nearby waterfront. 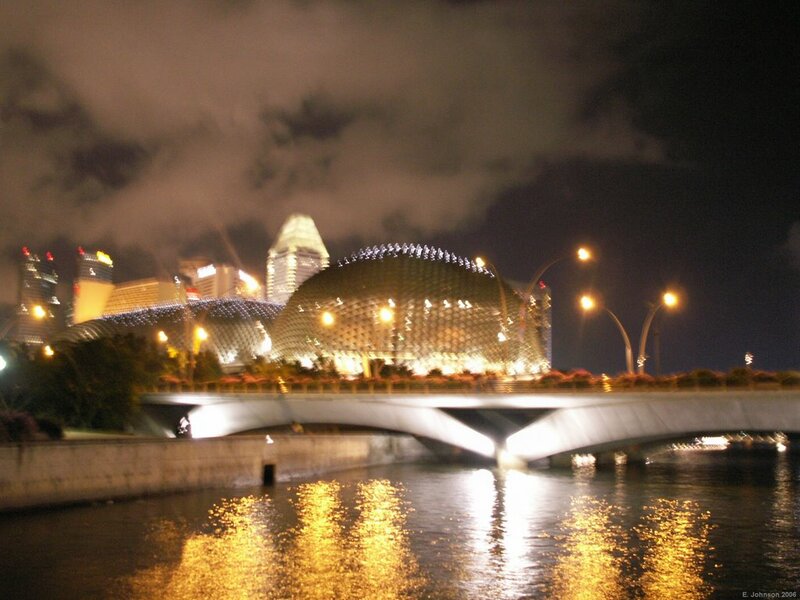 Here's one that was taken just before the concert, when it was still light outside. 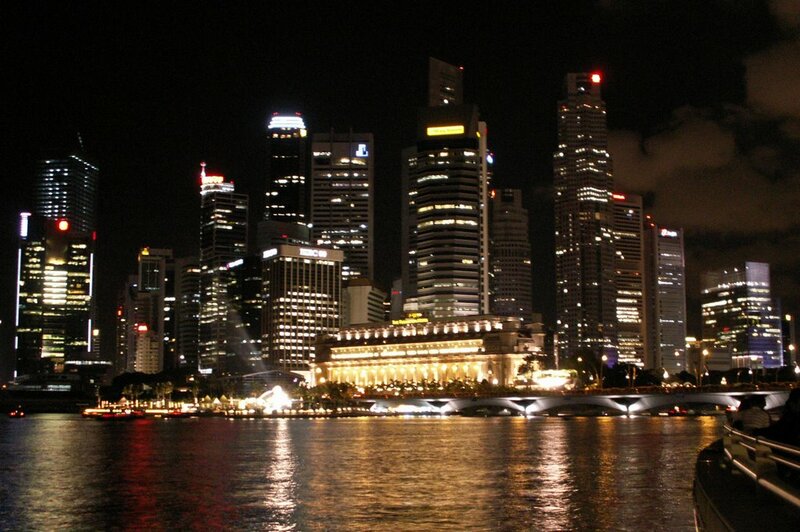 Singapore really does have a nice skyline! Down in the lower left quarter of the photo you can see the Merlion fountain while the rest of the picture is dominated by the skyscrapers of the business district. Of course, much of this wouldn't be possible if it weren't for the port traffic in Singapore. 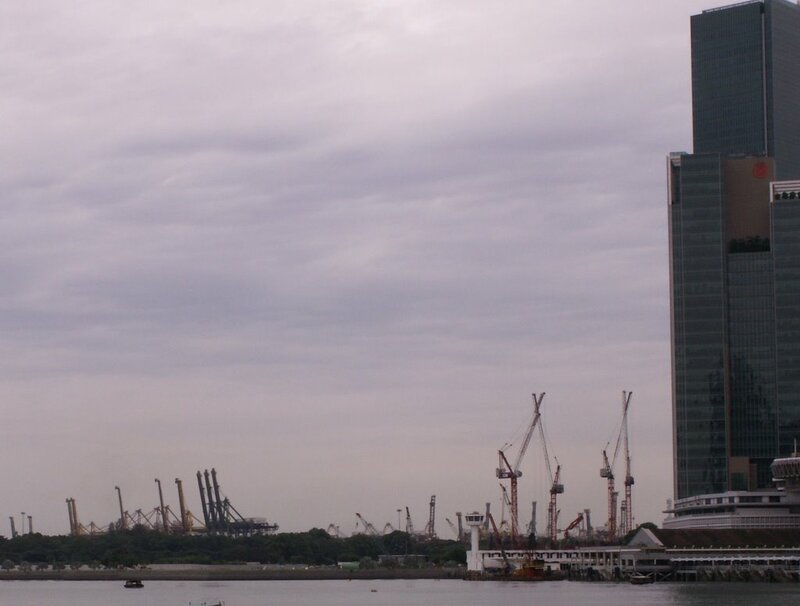 If you look just a little to the left of the skyscrapers, the cranes from the container port are visible from quite a distance. And with that, it was back to the states! wow that is a beautiful place. did you have fun? have not heard from you in a while, thought you forgot about me. well i have just been hanging out been babysitting my brother and getting ready for college i should start in august but i might wait til november notsure yet. well drop me a line.